Ray has been an adjunct professor at a number of area colleges, where he lectured in philosophy, social science, and history. He has traveled extensively in Europe, Asia, and the Pacific Rim. 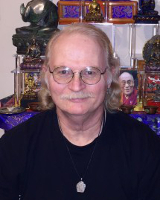 A practicing Buddhist for over 35 years, Ray has received teachings and empowerments from a number of Tibetan masters, including H.H. Dalai Lama.